This product has been discontinued. Its data is still reachable on our site for support purposes. Please find its replacement product in Recommended products section below. 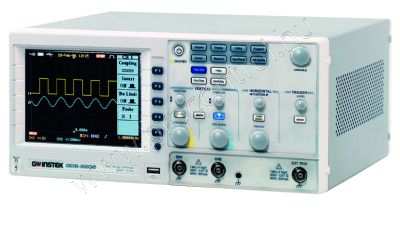 The GDS-2062 Digital Storage Oscilloscope comes along with All-In-One design, including 1GSa/s real-time sampling rate, 25k record length , 2 input channel , TFT color LCD display , USB support on flash drive storage, color printout, and remote control, Battery power operation and all the powerful Auto-Measurement functions.